The Music Group will be called the Music Appreciation Group from 17 January 2019. Since the last Newsletter the group has modified its name to Music Appreciation which the members believe better reflects the aims of our small group. We continue on the third Thursday at 10.00 n the Guild Room to play music on CDs, sometimes vinyl and sometimes downloaded onto modern equipment! Each person who has brought music plays one track according to the theme for the month, January made them all think hard as we had settled on the colour “Red” when we did our list before Christmas. Amazing how many thought of Guy Mitchell and “She wears red feathers and a Hula hula skirt”, must be an age thing! Johnny and the Hurricanes emerged in Red River Rock and, by way of contrast, the original version and more sedate tune of Red River Valley!” Mars the Red Planet composed by Holst gave us a classical input and the rockers had their fix of heavy metal by the Rolling Stones playing Little Red Rooster. You can’t say we’re not imaginative as I think we covered virtually every genre of music in that one meeting and the rest of the year has more to offer. For more information please contact me either direct or through the Group Co-ordinator. The meeting was held at the Resource Centre to learn how to play Indonesian percussion instruments called the Gamelan. Our teacher Nikki Kemp (supported by the organisers, “Good Vibrations”) gave us an insight into types of music from Java and Thailand and interesting facts about the culture and background of the music. She also produced some intricate puppets which would be used for shadow theatre and some wondrous hand carved wooden masks. White faces and eyes looking downward are good, red faces and eyes staring out are bad! Sounded a bit like our Punch and Judy but performances can go on all night! Our instruction to get out anything in the music room coloured red and gold brought forth a quantity of xylophone type instruments of varying sizes, numerous drums ranging from bongo to large ones and a set of gongs which were hung up. All these were hit, banged or beaten with a variety of wooden hammers and we were ready to start! The musical scale was different to western style and we had various practice runs and swapping around. It was a sort of 1, 2, 3, 5, 6 scale and numbers were written on the instruments to help us. I should mention that traditionally we should have been barefoot and sitting on the floor but only the brave tried that! As we got more proficient we tackled a proper bit of music, each with our own rhythm to play and with the “gonger” needing to remember to whack the 2 or the 5 so the rest of us knew where we were! One more lesson and I think we will be ready to go on tour – watch out Ukelele group, you may have rivals! Our small group continues to meet monthly, albeit with a recent change of Leader! Graham and Sue stepped down after a few years of producing a harmonious balance of music each month in accordance with a chosen theme. There is no requirement to be a musician to join the group, only an interest in listening to music! Last season we covered Jazz, Sea Songs, Music Hall and American music. Then we started to travel musically around the British isles with Scottish and Welsh music now ticked off the list. We covered the years 1900 to 1939 and had visitors to talk about music to us. Knowing that vinyl is making a comeback, this has also been included for the coming season and folk music will again be making a return. All the ideas for the monthly playlist come from the group members themselves who bring a CD or Tablet with music downloaded and we all listen; this makes for a varied selection as we all have different tastes, and you may find a genre that you like and have never listened to before! I am delighted to have been part of the Group for a while and I am now its Leader. After our August break, we resumed in September with a session on single instrument music. We had a varied programme from the human voice to a stepladder! Amongst the pieces we heard were Angie by Bert Jansch, Roundabout by Eric Roche, Apassionata by Ashkenazy, Maple Leaf Rag by Ronnies Rhythms, Human Whistle by the Ukulele Orchestra of Great Britain, The Seagull by the New Rope String Band and pieces by Bach, Beethoven and Liszt. In October we focused on music from 1900 to 1939 which highlighted what a wide variety of music there was at the time; Al Bowlly, Jelly Roll Morton, Holst, Irving Berlin, Carl Orff, Eric Coates, Poulenc, Marlene Dietrich were among the pieces brought along by members of the group. In November we are going to be looking at Scottish music then planning in December alongside Music from TV ads. Sue and I will no longer lead the music group after the December meeting. We have very much enjoyed our time facilitating this wonderful group. It is now time to hand over to someone else. In March we had a visiting singer/songwriter, Phil Pipe who performed songs he had written and told very amusing anecdotes about his life. Everyone agreed that it was a brilliant session and wished to invite him back in 2018. Our June session is a practical one, most likely to be drumming. We also welcome any new members to a very friendly group who enjoy listening to and learning about different forms of music. In December 2016, we had a planning session where we outlined the programme for 2017. The first session in January saw us focus on Jazz (traditional and modern). Visitors to our group since March have been, Peter Price, who ran a session for us on organ music using the organ in the church and, the Attenborough Bell Ringers, who ran a very entertaining and informative meeting and encouraged us to have a go. We have also had a session on musicals since 1960, children’s music and obscure CDs. Following her appearance on the front cover of the national U3A magazine, Kay Williams did a session on Berlioz for us all. November we enjoyed a second session on vinyl and in December we will be doing our usual planning for the future, having a fuddle and a short quiz. We are a smallish group and have been together for a long time but are welcoming to anyone who fancies joining us in 2017. We meet on the third Thursday in each month, apart from August, in the Guild Room. If you like listening to a variety of music and sharing your love of music with a group of friendly people, please come along and give us a try. In December, by a fuddle while we planned 2016 to a background of brass band music. We began the New Year with a session called duos and trios. Members brought along music ranging from classical trios by Mozart to music by a local duo, one of whom is a member of our Beeston Ukulele Group. Music played was, Dapper Dan, Peter Paul and Mary(Lemon Tree), Peter and Gordon(World Without Love), Steve Knightly and Martyn Joseph(Man O War/Swansea), Donizetti(Duet from Don Pasquale), Anne Ziegler and Webster Booth(Duet from Veronique), Martin and Eliza Carthy(Happiness), Cliff Richard and Sarah Brightman(duet from Phantom of the Opera), Flanders and Swann(Ill Wind), The Scaffold (Lily the Pink), Mozart(trio from Cosi Fan Tutte). Future meetings see a member focusing on guitar music, a visitor to take us through organ music, discovering composers and another vinyl session plus much more. In September Big Band Music was led by one of our members. We barely touched the surface so we aim to have another session in 2016 looking at English bands and from the 1950s on. Our last meeting in October had two of our group leading an enjoyable sing-along with guitar accompaniment. In November we look forward to Samba drumming and in December, Brass Band music and forward planning. We still have a few places for new members, please come and join us. Bright Phoebus by Lal and Mike Waterson, Wait A Minim – a revue. The New Rope String Band’s Nola, Igor Stravinsky’s The Rite of Spring. We look forward to Children’s music this month and Folk and Country Music in June. For information: Beeston Ukulele Group has now left the U3A but most of the band members are still U3A members. Frankie Laine – Mule Train. Our music group has covered among other things, comedy music, world music and music and religion. All these events were well attended and enjoyable. In November we will be having a practical session on drumming with a local tutor. We are due to plan our future programme at our December meeting. We will welcome any new members to this very friendly group who have eclectic tastes and enjoy listening together to a wide variety of input. We have just cut our first CD! An experience new to us all. Approached with trepidation but extremely enjoyable and successful. We have played many gigs all over Nottingham including for Framework in Arnold, a couple of 90th birthday parties and we have made strong links with College House Junior School in Chilwell. Here we played in an assembly and are planning future joint ventures. We were happy to play, once again, at St Barnabas’s Church in September for their Harvest Supper. We have already taken ten bookings for 2015 including one for Christmas 2015! The U3A music group continues with its varied and interesting programme. The members turn up every month to listen to and share music suiting all tastes. So far this year we have looked at the theme of colours in music, listened to a varied selection of piano music, had a go at playing a wide variety of musical instruments ourselves and enjoyed a group quiz. Most recently we “Discovered Composers” and were introduced to Bruckner, Puccini, Gregorio Allegri and Gerald Finzi by four of our members. They gave us a brief life history of their chosen composer and we then listened to fine examples of the composer’s works. In June several members will guide the group through their inheritance tracks and in July we focus on Comedy in music which should be a fun time! To round off the year, we have sessions on World Music, Music and Religion, Choral Music and our usual Christmas bash. Since the new year we have been very busy practising and fulfilling gigs around the region. In January we entertained the 2 o’clock club at the CRMC then on Valentine’s Day we visited Grove Court and performed for the Horizons group. More recently we travelled to Mickleover to be the after dinner entertainment for the ex Army Apprentices over 60s reunion in the Menzies Hotel and for the Friendship group at the Hope Centre on Boundary Road Beeston. Over the remaining seven months of the year we have fourteen further definite bookings and phone calls coming in every week, we’ve even had to turn some down! Still, we go from strength to strength waving the U3A banner showing you are never too old to learn, perform and enjoy(not necessarily in that order). The ukulele really is a splendid instrument and we are hoping to make a CD later in the year. After the summer break the music group gathered together to share their Desert Island Discs. This is a fairly regular session for the group and gives members of the group the opportunity to share some of their favourite music and explain why they chose their piece. Our October session was Film Music which ranged from the light-hearted (Mamma Mia) to the deeply moving (violin solo from Schindler’s List). Our programme for November is Music and Religion which will hopefully bring forward some very interesting and varied pieces of music for us to discuss. Our December meeting sees BUGs playing at the group’s Christmas celebration. In addition to playing at the music group’s Christmas party and the full U3A members’ meeting in December, BUGs have a whole host of gigs during November/December. In November we play the Festival of Light celebration on the 30th at CRMC. In December we play at two Probus meetings, the Attenborough and Chilwell Women’s Group, The Grange Nursing Home and Greenwood Court Retirement Living. We have even accepted bookings for January, May and July of 2014!! In May we had a super session on World music, where we were enthralled by the variety of music from South Africa, India, South America and Europe. It also provided a talking point about the power and influence of music. In June we welcomed local singer/songwriter Phil Langran who entranced us with an insight into his approach to song writing as well as his musical influences. He illustrated this all with guitar playing and singing. A great session. Brass was the theme for July when members brought along the wide variety of music linked to brass. We heard classical, band and jazz pieces which featured brass instruments and learned a good deal about technique from one of our brass playing members. We did not meet in August but the forthcoming September meeting is the popular Desert Island Discs session. Seven members volunteered to bring along a piece of music that means something significant to them to share with others. The ukulele group has had a busy time over the past months and looks like it will be busy up to the Christmas period. We have played at many venues in the region and entertained people at local care and nursing homes, clubs and events. We are booked for several more gigs next month and October. There has been a demand for us to play at many Christmas events already so we are really happy. This has meant we have had to practice a lot and have met every fortnight or so to learn new songs and prepare carols! We will play at the December full U3A meeting and if you want us to play for your organisation, ring us soon or be disappointed! 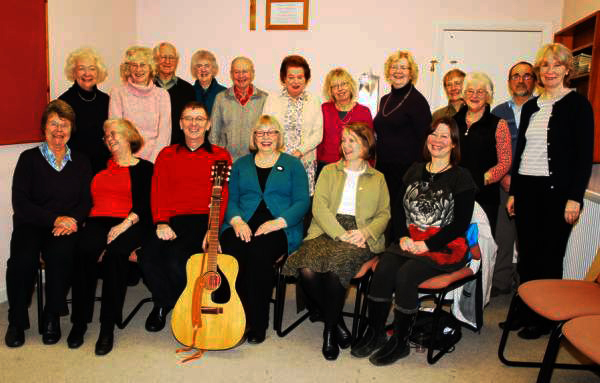 The U3A music group has continued with an agenda full of variety. Since Christmas we have enjoyed sessions on music about the seasons, Irish and Scottish music, and Chamber music with a wind focus: all led by members of the group who never fail to impress with the breadth of their knowledge and enthusiasm. A great success also was our “try an instrument” session. Members enjoyed trying out a variety of instruments such as hand bells, trumpet, flute, clarinet, guitar, ukulele, banjo, piano accordion and numerous percussion instruments. We all got together at the end to play “Old Macdonald Had A Band”. Great fun and a session to be repeated by popular demand. This month (May) we reprise our very successful World Music session and in June we have the visiting local singer/songwriter Phil Langran. In July a Brass session will take us into our summer break. We have added a percussion section and guitaring recently. Our gigs continue, with visits to two local retirement/care homes. We shall also play at the Beeston Community Celebration at Round Hill Primary School on Saturday 6th July. The group have expanded their repertoire with more difficult songs and have put together a really interesting set, including a self-penned song, poems and individual items as well as the usual sing-a-long songs. BUGs go from strength to strength! January – A themed session on “Seasons” where members bring along music connected with the theme and listen and discuss. February – One of our members will lead the session on Irish/Scottish music. March – Another of our members will lead us through Chamber Music with the emphasis on wind instruments. April – Members of the group will bring along instruments to allow other members to try them out and maybe we can play something together? May – We shall be focusing on World Music and listening and discussing music from all around the planet. June – Phil Langran (a local singer/songwriter) will visit and play and talk to us about his work. September – Desert Island Discs is one of our favourite sessions. Several of the group will bring along music they would like to take with them to a desert island. October – A fun packed session on film music. November – We will look at the links between music and religion in this meeting. These topics may be subject to change and will be detailed closer to the dates of the meetings. New members always welcome. What a busy first year the BUGS had! We played nine gigs in total and we published our own songbook. We move into our second year with excitement. Early 2013 and we are learning many new songs with a view to assembling a varied and entertaining set to perform to interested parties. We have also made a link with Round Hill Primary School and look forward to joint projects with their ukulele group. By the end of the year we hope and aim to make a CD of our favourite tunes, be part of a documentary film about our community link with Round Hill and continue to play at events throughout the Nottingham district. The music group meets on the third Thursday of each month in the Chilwell Road Methodist Church. We always have an interesting programme generated by the group. Since June 2012 we have had a music quiz, Desert Island discs, a very interesting session led by one of our members on Musical Theatre, and another equally interesting session on Baroque music run by another. In November we have organised World Music to be the focus with time to look forward to developing a programme for 2013. In December we have invited a local lute player to play and talk to us about this fascinating instrument. We still welcome new members to this group. Why not spend some time listening to, learning about and discussing music with a really friendly group of people? Our seventeen strong group continues to flourish. After a brief summer break we stepped up the practices and expanded our repertoire. The ukulele is such a fun instrument to play. We always enjoy the practices even though they can be challenging at times. On October 31st we were invited to Queenswood Methodist Care Home to play at one of our member’s mum’s 100th birthday celebrations. This was very enjoyable and required us to go through most of the songs we knew till the Mayor and the tea trolley turned up! Our reputation is growing and has reached as far as Sherwood. The Progressive Synagogue has invited us to perform at a musical evening on November 21st and, by the time you read this, we will be flushed with success – or not. December is a busy month for the group as we will be playing in the Beeston Christmas Lights Switch on event. This is Saturday 1st December from 12 noon to 6.15 pm and we have been booked for the 1.30 pm slot. We will be playing on the bandstand/stage in the Square so we are hoping for good weather and we may have to adopt fingerless gloves to play if the temperature is cold. We have never played in the open air before so it will be a first for us and we are quite worried how the sound will carry as the ukulele is a small and reasonably quiet instrument. We then will move on to the Season of Lights event at Chilwell Road Methodist Church on the same day to play there. Two performances in one day! Also a first. We hope to see most of you at the December full U3A meeting where we will again play for you during the morning. So, as you can guess, we are learning carols to perform but we didn’t want to do the traditional ones so we’ve gone out on a limb to perform some unusual ones which we hope you will enjoy and join in the choruses. We are also in the process of producing a BUGs ukulele songbook of the songs we have learned this year (our first) and hope some will be made available to buy at future meetings by enthusiastic music lovers. We look forward to 2013 and further expanding our repertoire, chord knowledge and gigs because we have had an exciting first year and kept a very stable and happy group who enjoy playing and singing together. The monthly meetings (third Thursday in every month, 10 am in CRMC Epworth Room) are always well attended (31 on the register) and we have enjoyed a varied programme of musical interest. In January we featured “Celebrations” where members brought along and discussed music on this theme. It is encouraging how the group volunteer and share their musical knowledge and love of their favourite pieces. This was followed by February’s meeting “Parlour Songs and Party Pieces”. Members brought along songs, sheet music and even photos to recall their musical influences, upbringing and memories. In March we emulated a Radio 4 feature by listening to our “Inheritance Tracks”. Members of the group brought two pieces of music to the session. One was a piece of music they remembered, or inherited, from their early days and one piece they would like to leave to the future generation. This led to many reminiscences and much discussion. In April we were the audience for the debut performance of “BUGs”, our own U3A ukulele group (see article on BUGs). A “Weather” theme is the focus for our May meeting and it is always exciting to turn up to the meeting and find out what is in store for us all. With a bit of luck, a hint of summer weather will be chosen to cheer us all up after this wet Spring! At our recent group meeting, we decided on the following programme for our monthly meetings up to December 2012. June 21st. A Music Quiz. July 19th. Desert Island Discs. Nov 15th. World Music/Visiting Musician. The core group of 16 members meet every couple of weeks to practice and, over the past few months, we put together a programme of songs to entertain the music group in April. The performance lasted about thirty minutes and included songs from the sixties, Amazing Grace, a medley and our own version of “When The Saints”. The response to our concert was very encouraging. The audience applauded, joined in the songs and asked for an encore. We now move on to the Indoor Jubilee Celebration. Members of the group work really hard and are very keen. Over the next months, we will be busy learning a few new tunes, new chords and different strumming styles. The only way is up! January’s theme was “Celebration” and members were asked to bring along and share music connected with the theme. February’s meeting was led by Pat and concentrated on parlour and party songs we all know and love. In March we are going to look at which piece of music we inherited from the previous generation and which piece we would hand down to the next generation. The long-awaited concert by the BUGS will happen in April along with a listen to music of stringed instruments. We meet at CRMC every third Thursday in the month from 10 -11.30 am in the Epworth Room. We welcome new members up to a maximum of 30. Thereafter we will compile a waiting list. Graham and Sue, March 2012. 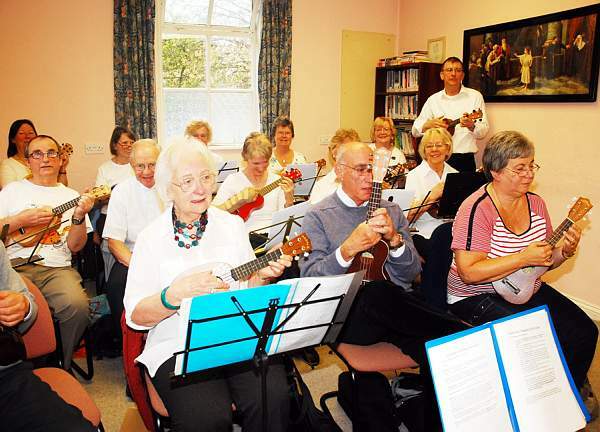 A Ukulele group has formed from the Beeston U3A music group. We call ourselves BUGs. We meet once a fortnight in a room generously offered by one of our members. We first met in September when, clutching our instruments, about sixteen people turned up and took their first steps in ukulele playing. Since that first tentative step, the group has met three more times and maintained its numbers well. We have already mastered three chords. This means we can play the whole of the Status Quo back catalogue! It is really great to see people who have never turned their hand to learning a musical instrument, or read music, concentrating hard, using dextrous fingers to pick out the chords and a dextrous wrist to strum the strings. We now have a repertoire of six songs and in the new year we are working towards a short concert for our fellow music group members. You never know, after some time, we may be in a position to play at a full U3A meeting! We’ll keep you posted about our progress.